You'll LOVE this step by step approach to solving multi-step addition and subtraction story problems promoting independence and confidence. 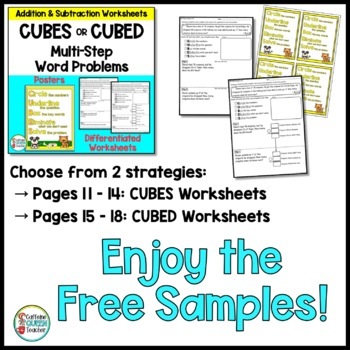 Choose from the CUBES or CUBED story problem strategy. Students interact with the word problems as they are guided through the steps of the strategy. Leading questions help students succeed. 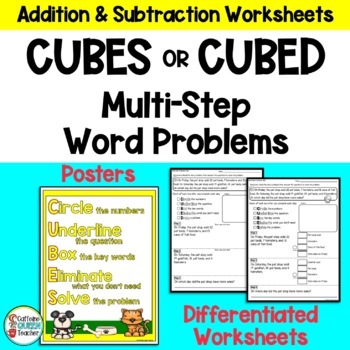 Please note: the 10 worksheets using CUBES are identical to the 10 worksheets using CUBED, except for the acronym of CUBES/CUBED. This packet aims to promote confidence and independence. 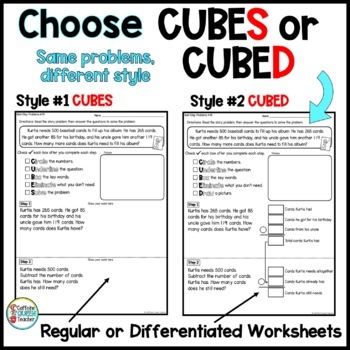 Encourage your students to become active readers as they engage in the CUBES/CUBED activities. 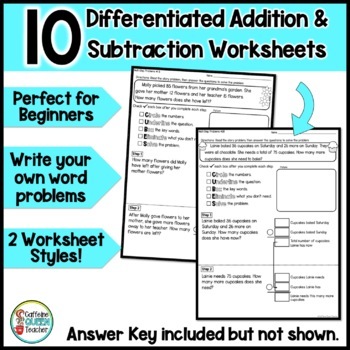 The addition and subtraction problems in this packet were developed to be fairly simple for students to solve independently in order to lead to confidence and independence. I like to use each page as either an in-class assignment, as part of a math center for guided math, or as a homework page. The pages do not all need to be completed on consecutive days. They could also be used as review to spiral back to skills previously taught. Please Note: This resource is NOT EDITABLE. Please preview and try the FREE sample to make sure it will work for you! All of my resources are marked at a STEEP discount for the first 48 hours for all loyal followers. As new resources are developed, you’ll get an e-mail alerting you about new resources.